Patrick Stump, vocalist from Fall Out Boy has been working on solo material for a few months now. Many Fall Out Boy fans followed and waited to hear what he would have offer. Many also thought he would disappear after FOB. Earlier in the month he posted two versions of the song "Spotlight" and left it to fans to vote on which they liked better. The winner chosen will be on his upcoming album due out in February. 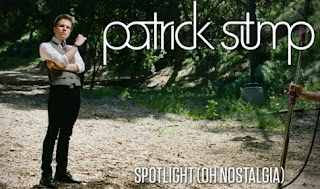 Now for some of those naysayers out there about if Patrick Stump is indeed talented, I'll let his performance of "Spotlight" speak for itself. Now I am sure many die hard FOB fans probably will whine about the music because it is different from what he used to be a part of. However, this does not mean it is not good, give it a chance. Watch below.